This is a FutureFactories Studio collaboration between Product Artist Lionel T Dean and Digital Sculptor Philip van der Walt from BunnyCorp. 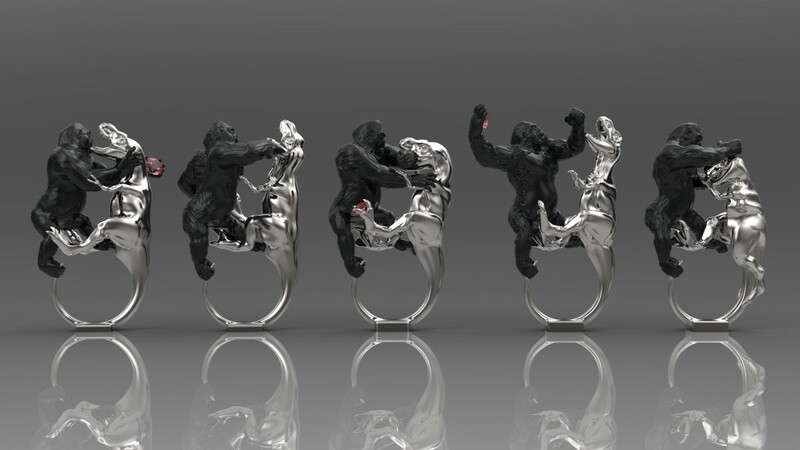 T-Rex versus The Gorilla is a set of five jewellery ring designs inspired by 1950’s Japanese science fiction. Each ring represents a different point in a manga animation fight sequence between the monster characters. The fight is over a precious stone which the creatures use as a weapon in their encounter. The movie is a traditional hand-drawn animation and the rings have been digitally sculpted from the appropriate frames. The clip references 1950’s science fiction, 8 bit videos games and manga animation. The rings themselves are cast in silver from 3D printed waxes with the gorilla rhodium plated to distinguish the characters. The creatures sit on top of the finger with the tail of the T-Rex forming the loop of the ring. The underside of the ring carries a QR code; when scanned this reveals the movie played back via your mobile device.